Austin Colmery singled home Michael Cuatillo with one out in the bottom of the eighth inning Tuesday to give Wilmington (Delaware) a 1-0 win over Desert Oasis in the championship game of the American Legion World Series in Shelby, North Carolina. 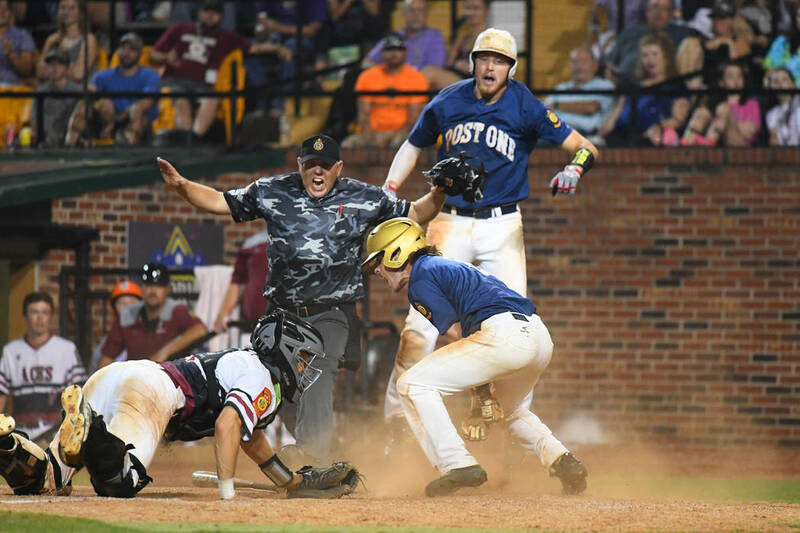 Wilmington's Michael Cautillo scores the winning run in the eighth inning at Veterans Field at Keeter Stadium in Shelby, N.C., on Tuesday, Aug. 21, 2018 during game 12 of the 2018 American Legion World Series. Photo by Lucas Carter / The American Legion. Desert Oasis' Josh Sharman pitches during the American Legion World Series Championship game at Veterans Field at Keeter Stadium in Shelby, N.C., on Tuesday, Aug. 21, 2018 during game 12 of the 2018 American Legion World Series. Photo by Lucas Carter / The American Legion. 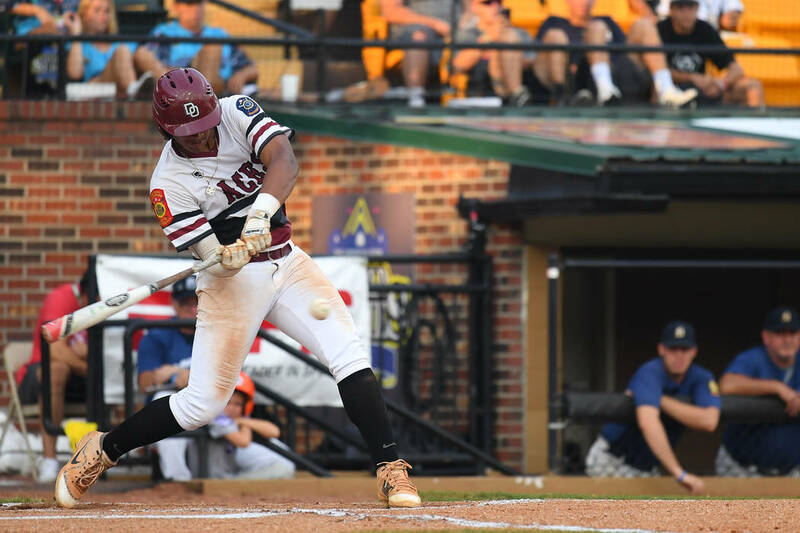 Edarian Williams takes a swing during the the 2018 American Legion World Series championship game at Veterans Field at Keeter Stadium in Shelby, N.C., on Tuesday, Aug. 21, 2018 during game 12 of the 2018 American Legion World Series. Photo by Lucas Carter / The American Legion. 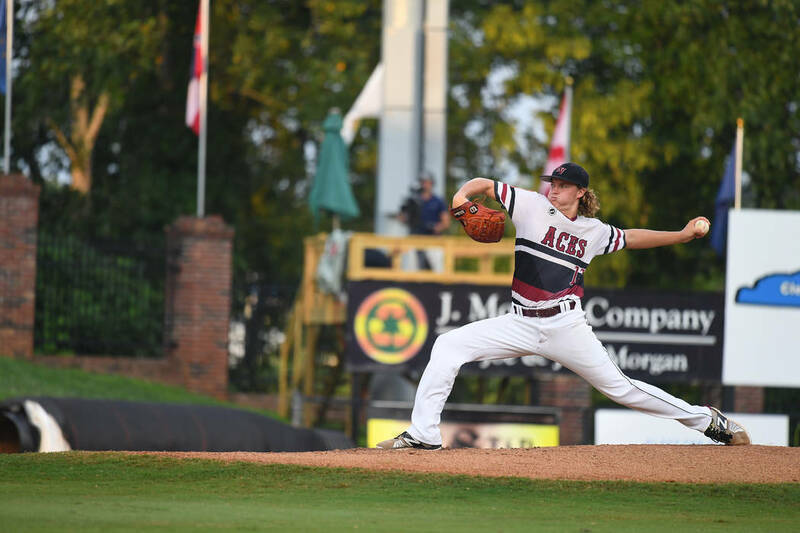 Desert Oasis' Aaron Roberts pitches in the eighth inning of the American Legion World Series championship game at Veterans Field at Keeter Stadium in Shelby, N.C., on Tuesday, Aug. 21, 2018 during game 12 of the 2018 American Legion World Series. Photo by Lucas Carter / The American Legion. 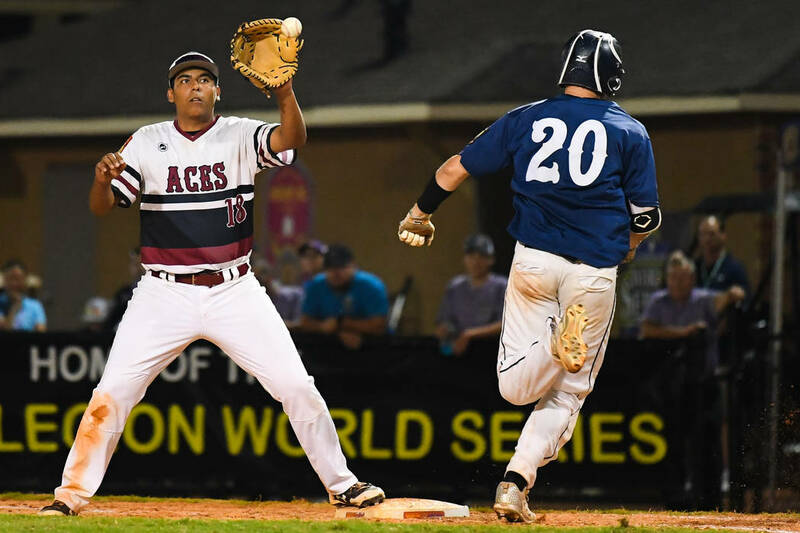 Desert Oasis' Jimmy Gamboa records an out at first during the American Legion World Series Championship game at Veterans Field at Keeter Stadium in Shelby, N.C., on Tuesday, Aug. 21, 2018 during game 12 of the 2018 American Legion World Series. Photo by Lucas Carter / The American Legion. SHELBY, N.C. — Josh Sharman pitched seven shutout innings and picked off a pair of runners late in the game. It wasn’t enough for Desert Oasis. Wilmington (Delaware) scored a run in the bottom of the eighth on a one-out single by Austin Colmery to earn a 1-0 victory over the Aces in the championship of the American Legion World Series. The title is the first for a team from Delaware, whose teams had been 2-6 all-time in ALWS games before this year’s run. Sharman scattered four hits across seven innings while striking out eight. He picked a runner off second base on a trick play in the sixth, then picked a runner off first before striking out the final batter he faced in the seventh. But Wilmington (38-4) finally broke through against reliever Aaron Roberts in the eighth. Leadoff batter Michael Cautillo drew a walk off, and Chris Ludman laid down a sacrifice bunt to move Cautillo to second. On a 2-2 count, Colmery singled up the middle to score Cautillo and kick off the Delaware celebration. 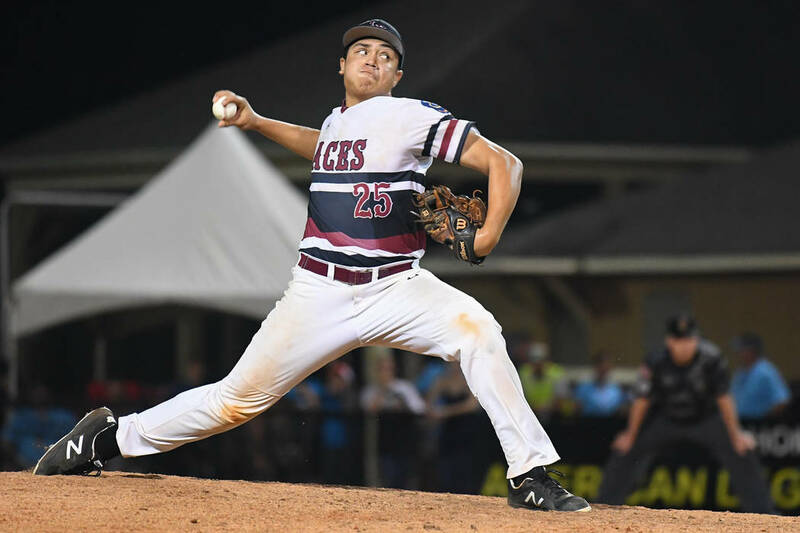 It was Ludman’s second shutout of the World Series, and he was named the George W. Rulon American Legion Player of the Year. But he got some help from his defense in the top of the seventh. Shortstop Nate Thomas ranged up the middle, then went head-over-heels and tossed a high arc to first base to end the top of the eighth inning. Had he not gotten the out, Desert Oasis would have had runners at the corners. “Nate made an amazing play there at the end to help us win,” Ludman said. Desert Oasis’ Zach Czernawski led off the eighth with a single, just the fourth hit of the game for the Aces (50-17). Ludman got the next two outs, but Jason Sharman’s grounder up the middle looked like it would extend the inning. Thomas made sure it didn’t. “The runner on first was stealing so I actually had to break a little to second when I saw the play hit up the middle,” Thomas said. “I’m not very good at diving headfirst, but I saw the ball, laid out for it. I knew I wouldn’t be able to make the play at second. … I just threw as hard as I could over to first. Wilmington missed some scoring chances earlier in the game, including a heady play by the Las Vegas defense in the sixth. Pinch runner Nick Muzzi fell for a faked throw to second base by Josh Sharman and got caught in a rundown between second and third. Sharman then picked off Jack Dubecq in the bottom of the seventh.